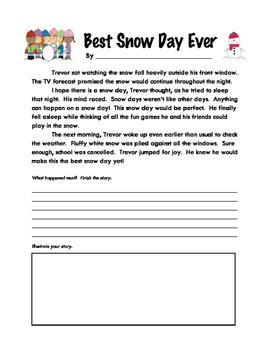 Want a quick and no prep activity to practice reading comprehension, writing skills, and creativity? Students read a short selection and are asked to finish the story. The Story Starters are open ended, but students will have to make inferences in order to create an ending that makes sense. Story themes and characters are relatable, increasing motivation, and providing the opportunity for students to make connections to their own lives in the writing prompt. Concluding with an illustration, students are able to both visualize their story, and enhance the final presentation.